This is the first installment in a series of tutorials that will help users get the most out of the software or let potential users get a deeper look at what the software does. 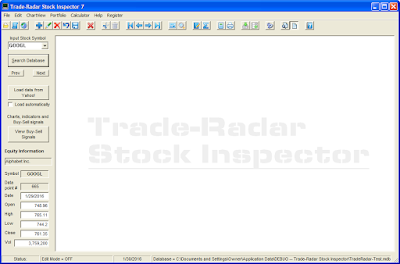 Let's get started with an overview of the Stock Inspector software. The primary function of the Trade-Radar system is to identify reversals in price movements. These reversals are translated into BUY signals or SELL signals. The trick is to determine if the reversal is significant enough to enter a trade with confidence. The Stock Inspector system will help you do that. Furthermore, the Trade-Radar software makes it easy for you to assess the valuation and financial strength of any U.S. stock in which you might be interested. It does this by evaluating a wide range of fundamental data. This system will support analysis of stocks, mutual funds, exchange traded funds, indexes, etc. Essentially anything with a closing price that moves in a manner that allows it to be displayed on a chart. When using daily data, this system may be of most benefit to those traders who are interested in “hitting singles and doubles”. In other words, 15% to 30% gains over the course of several weeks to several months. Longer term trading is supported through use of weekly or monthly data. This application is not intended to support day trading. In order to do its magic, the Stock Inspector software needs lots of data. We have extensive data retrieval built into the application and as you will see below, it is very easy to use. Note that the software uses a database to store the latest data that was loaded. This will allow you to use the program even if your Internet connection is temporarily out of order. In the screen shot above, there are three big buttons on the left hand side of the window. We'll be using these buttons a lot as we go through this tutorial series. In this next screen shot, we'll zero in on them so you can get a better look. For this tutorial we will concentrate on the top two buttons, "Search Database" and "Load data from Yahoo!" as well as the Stock Symbol drop-down. In order to load data and begin your analysis, you need to tell the program what stock you are interested in. This is done simply by entering the stock symbol in the text area of the stock symbol drop-down. The drop-down is labeled "Input Stock Symbol" so you know you are in the right place if that's where you are typing. Note that I have entered GOOGL in the example screen shot above. If the symbol is already in your database (because you entered it at some earlier date) then the program will read its database and retrieve any information that was previously stored the last time you loaded data for it. If the symbol is new, the program will ask you if it's OK to add the new symbol to your database. Just click the "Yes" button. If the symbol is already in your database you can also just use the drop-down to look for it. In this case, you don't have to do any typing at all. If you are happy with all the defaults, you can just click the "OK" button and the program will retrieve all the data related to this stock symbol and store it all in your database. That data will be used to populate the charts and the Dashboard screens (more about charts and the Dashboard in future tutorials) and to generate the BUY/SELL signals. If you want to deviate from the defaults, we offer plenty of flexibility. 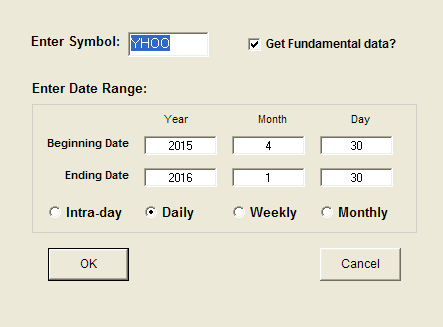 You can accept the date range that is automatically provided or you can choose a custom date range. The default is two years of daily data from the current date back. This default date range can be managed using the Program Preferences so you can set it to any period of time that suits you and your style of analysis and trading. In the case of the screen shot above, you can see that my default for daily data analysis is more like eight months rather than two years. The period can be daily, weekly or monthly; use the radio buttons to choose. Naturally, you would use weekly or monthly data for more long-term analysis. Note that we have added an option to retrieve intra-day data but I would caution you on relying too strongly on it to guide your trading. Intra-day data is provided more for informational purposes so you can see price/volume action at a little deeper level of detail. If you have already selected a symbol on the main screen of the Trade-Radar program as described above, that symbol will pre-fill for you. You may change it to another symbol if you like. In either case, that is the symbol that will be searched for on the Yahoo site in order to download the data. If you are not interested in evaluating financial data you have the option to skip this part of the data download by unchecking the “Get Fundamental Data?” checkbox. The data download will run faster and you will still be able to do all your technical analysis and evaluate the results using the Dashboard screen. Skipping the fundamental data might be appropriate when evaluating ETFs, for example, but I have to stress that one of Stock Inspector's best features is the robust fundamental analysis it offers. So always keep it checked whenever you are analyzing individual stocks. If you are choosing a weekly or monthly time period, the symbol must be the actual stock symbol; however, the program will automatically create an alias in the stock symbol drop-down that allows you to differentiate between daily data and other time periods. For example, weekly data for GOOGL would be listed in the drop-down as GOOGL-W while daily data would be listed simply as GOOGL. In other words, the drop-down will show the symbol with a suffix indicating weekly or monthly or intra-day. The next time you pick GOOGL-W from the drop-down, the program will know you are looking for weekly data. One little extra that Stock Inspector does for you is create files of price/volume data. These files can be loaded into spreadsheets or other tools so you can do your own analysis. Details on this can be found in the help file. 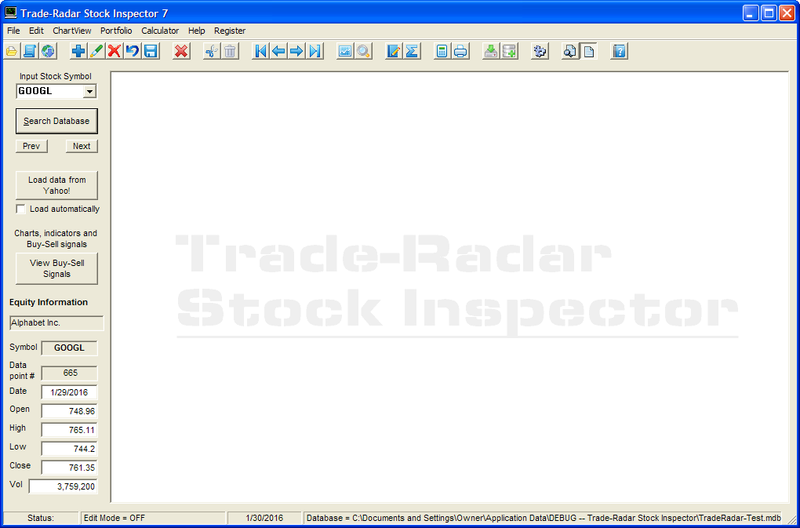 Hopefully this post has shed some light on loading data into Trade-Radar Stock Inspector. You should be able to adjust the parameters for loading data and understand how all data is stored in a database that is "under the covers" of the Stock Inspector program. In our next tutorial, we will start looking into the charting functions of Stock Inspector. Be sure to come back for that one and you will learn how are signals are generated and why we are different from so many other stock analysis software products.